Sometimes it’s the simplest things that taste the best! This weekend I set out to make the simplest of pizzas using fresh ingredients and made almost completely from scratch. I say “almost” because I didn’t make the mozzarella…this time. I started by making the pizza sauce from fresh tomatoes, garlic and onions, slowly roasted on the grill and then made into a sauce that was reduced on the stove top until it was thick and rich. Then I made the dough by hand, with soft, fluffy “00” pizza flour–you can find this at your local Italian import store or online. 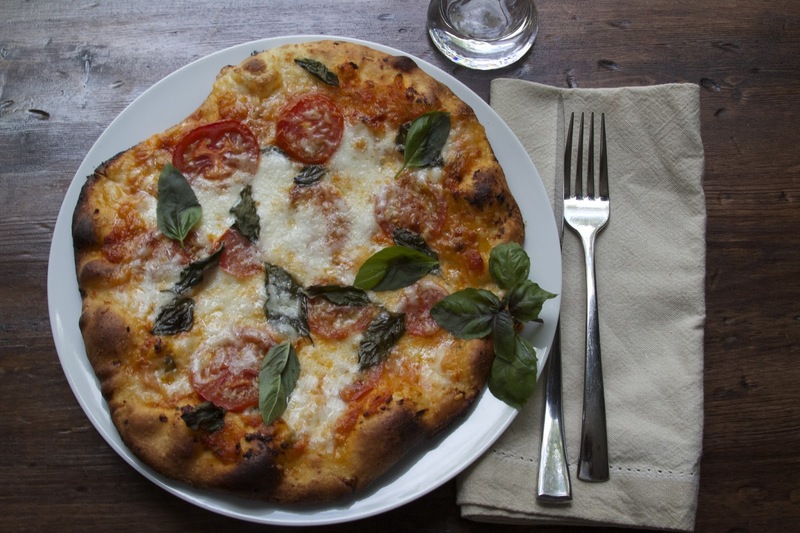 We order our 00 flour from Giusto’s Vita-Grain, but all-purpose flour will also work. 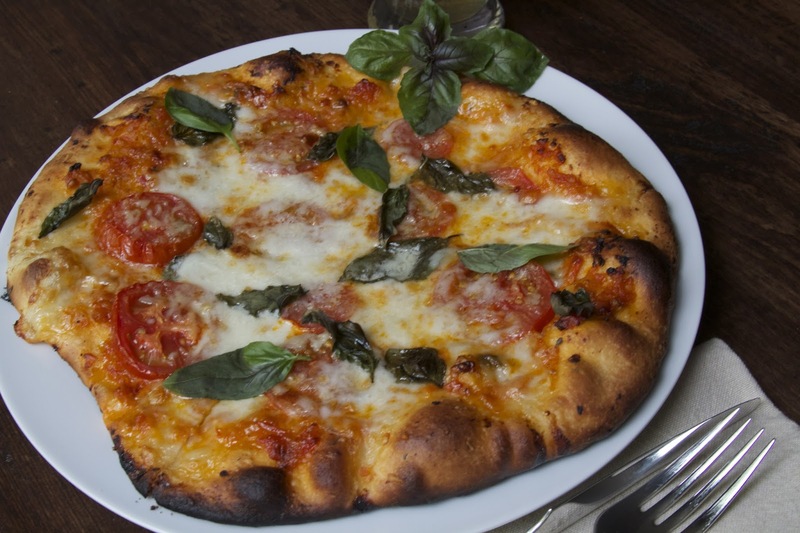 To top it off, a simple combination of fresh sliced tomatoes, fresh mozzarella cheese, grated parmesan and fresh basil. Delicious and oh, so simple! I’ll start first with the dough. 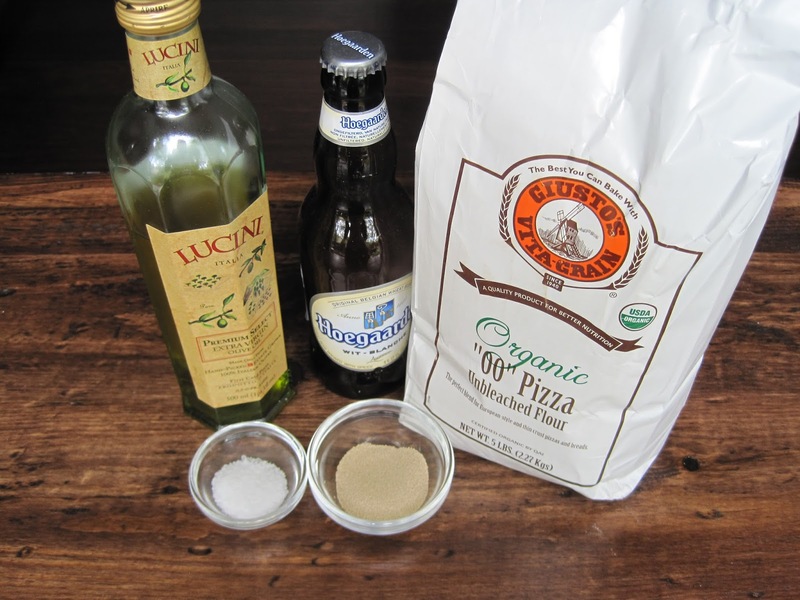 Pizza dough from scratch tastes better and is easier to work with than any store-bought pizza dough! This recipe is adapted from the recipe right on the back of the Giusto’s bag. Mix the yeast into the warm water in a small mixing bowl. Combine the flour, salt and olive oil in a mixing bowl and slowly incorporate the liquid, using additional flour if needed. Knead the dough for 7 to 8 minutes. I used my Cuisinart food processor to do this and it takes considerably less time. I placed the flour, salt and olive oil in the bowl of the food processor outfitted with the dough blade. Turn on the dough setting and pulse until the dry ingredients are mixed. Turn the machine on the dough setting and slowly pour the beer and the yeast and warm water mixture into the feed tube. When the dough cleans the sides of the bowl, continue to knead for 30 additional seconds. Remove the dough from the food processor (or stand mixer if you have it) and quickly roll into a ball. 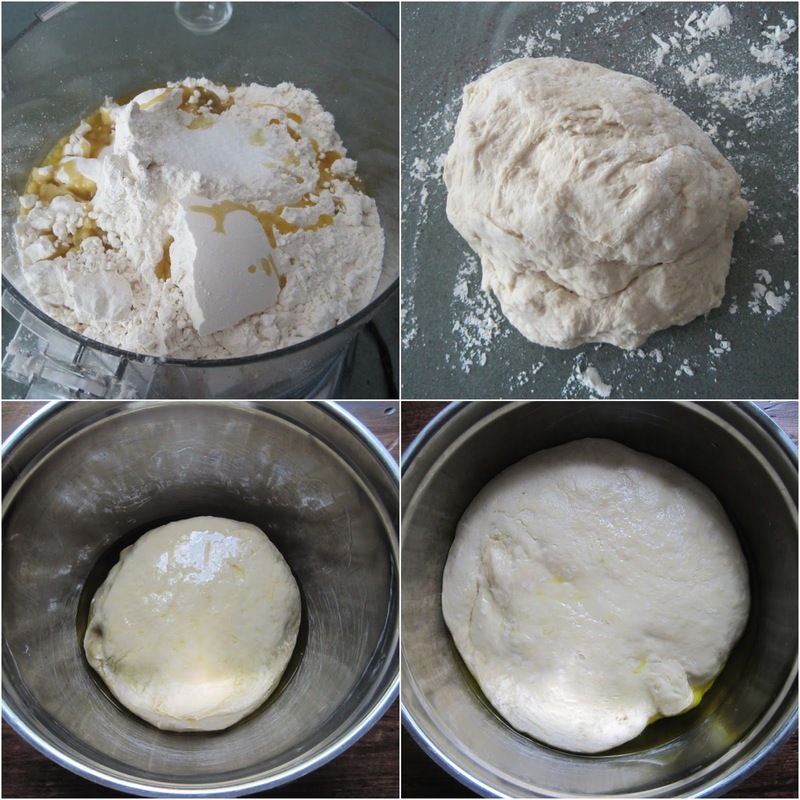 Pour a little olive oil in the bottom of a mixing bowl and place the dough ball inside. Coat with a little more olive oil. Cover the bowl with plastic wrap or a damp kitchen towel and put in a warm spot. A perfect warm spot is in an oven that has been preheated for one minute at 350 degrees. Turn off the oven after one minute and place the bowl inside. Allow the dough to rise for 45 minutes. It should double in size. I’m going to give the credit for this sauce recipe to the Man of the House–being half Italian, it’s in his blood to make great sauce! 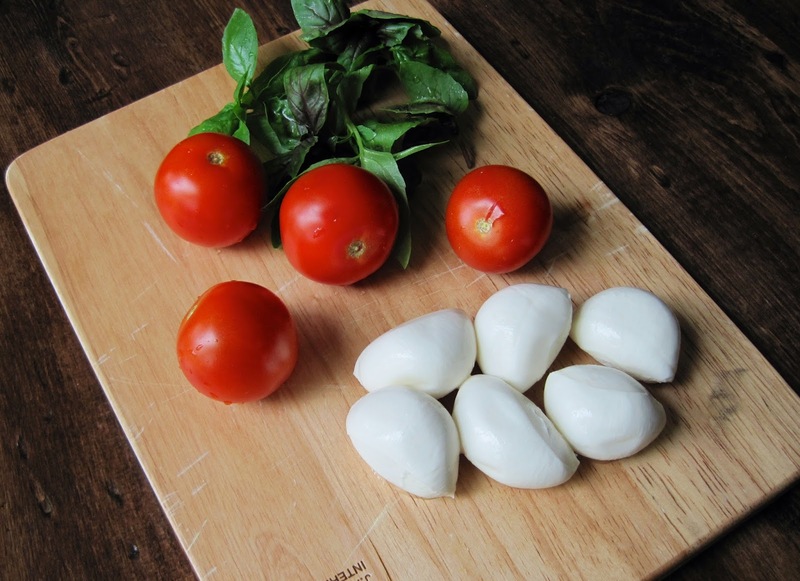 To make the pizza sauce, place several tomatoes, four cloves of garlic, one whole onion, roughly chopped on a sheet pan and drizzle with olive oil and sprinkle with salt and pepper. Place either in a 350 degree or on a grill heated between 300-350 degrees. Roast the vegetables for at least an hour or until the skins burst and become wrinkly. 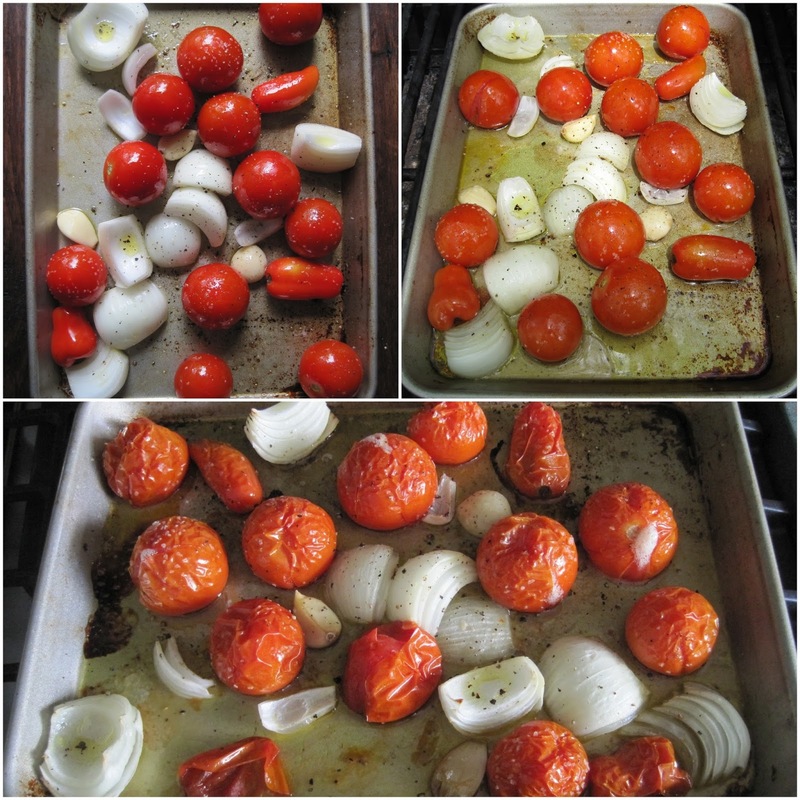 Roasting the tomatoes brings out the sweetness of the tomatoes and is a great way to get that summer sweet tomato flavor in the winter time when tomatoes are out of season and generally not very tasty. 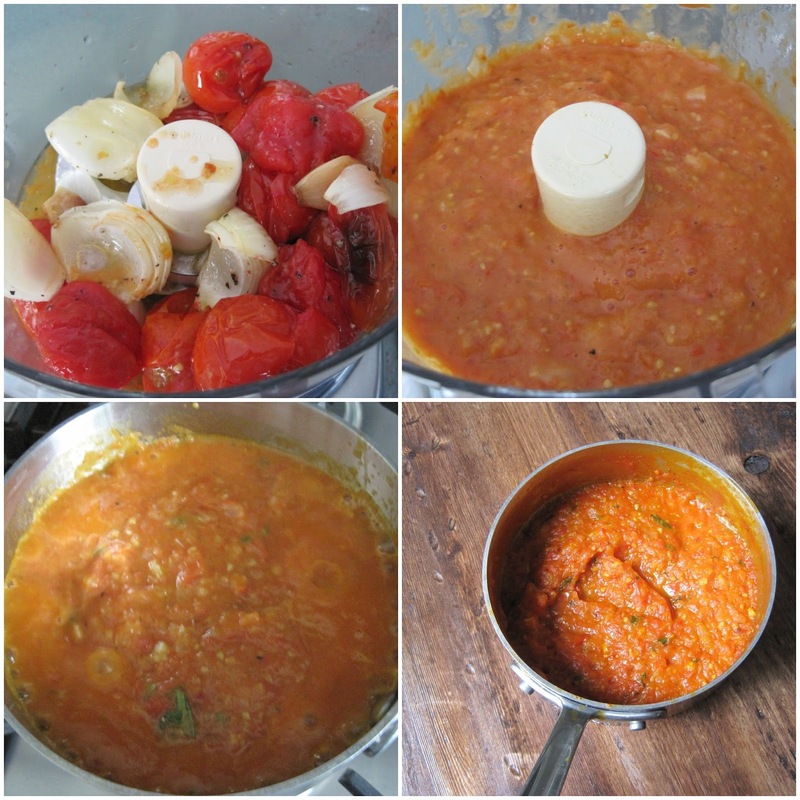 After the tomatoes have finished roasting, pour the entire contents of the pan into the food processor and puree. Then put the puree, along with a tablespoon of freshly chopped oregano, about 1/2 teaspoon of red pepper flake, salt and pepper into a sauce pan over medium high heat. Reduce the sauce until it is thick enough to run a spoon through it and hold its shape. Now the rest is the easy part! Preheat your oven or grill to 500 degrees. 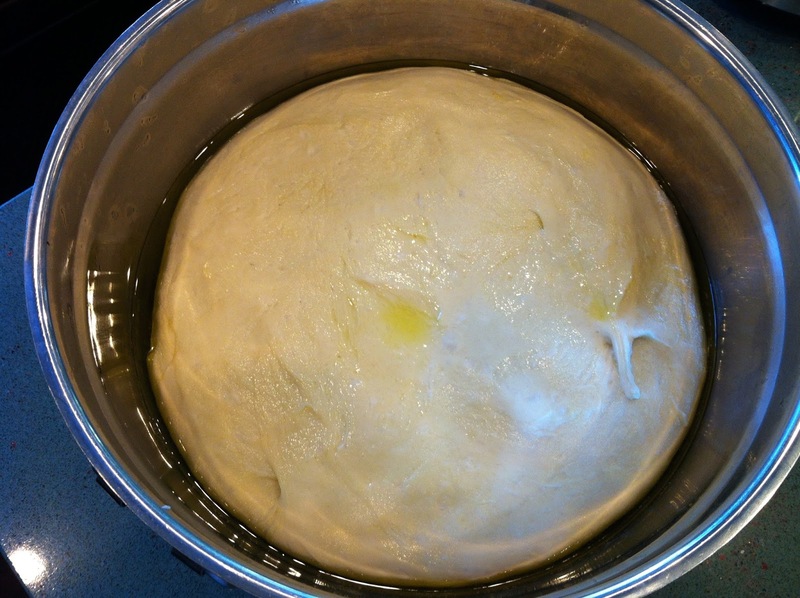 After the dough has risen, punch it down and divide it in portions (depending on the size you want for your pizza). This dough yields four personal sized pizzas or two large pizzas. Place the dough ball on a floured surface and knead for a few minutes to incorporate the extra flour–you don’t want the dough to be too sticky. 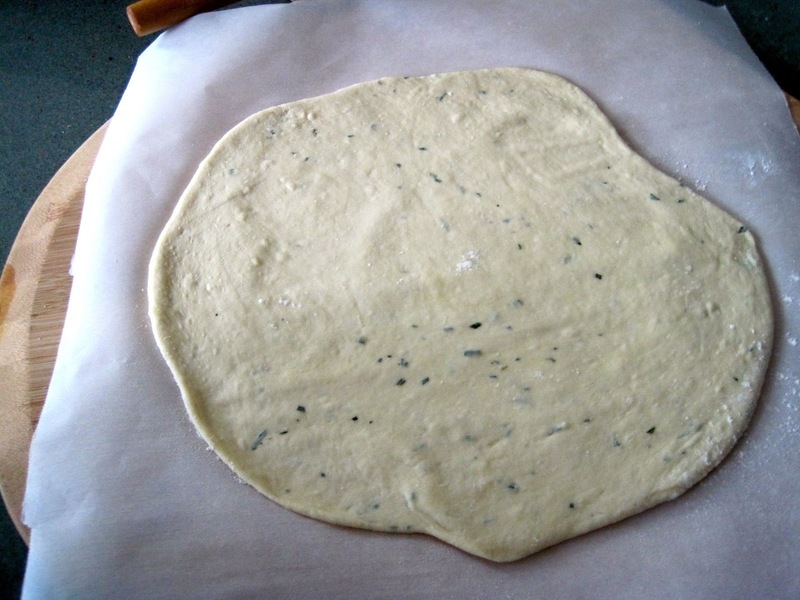 Roll the dough out with a rolling pin and stretch it over a pizza stone or pizza pan. We like to brush the dough with olive oil before baking. To keep the dough from sticking, either oil the stone or pizza pan with olive oil and sprinkle corn flour or corn meal over it, or, do what I did for this pizza and roll it out on top of parchment paper on a pizza peel, then slide it onto the hot baking stone. 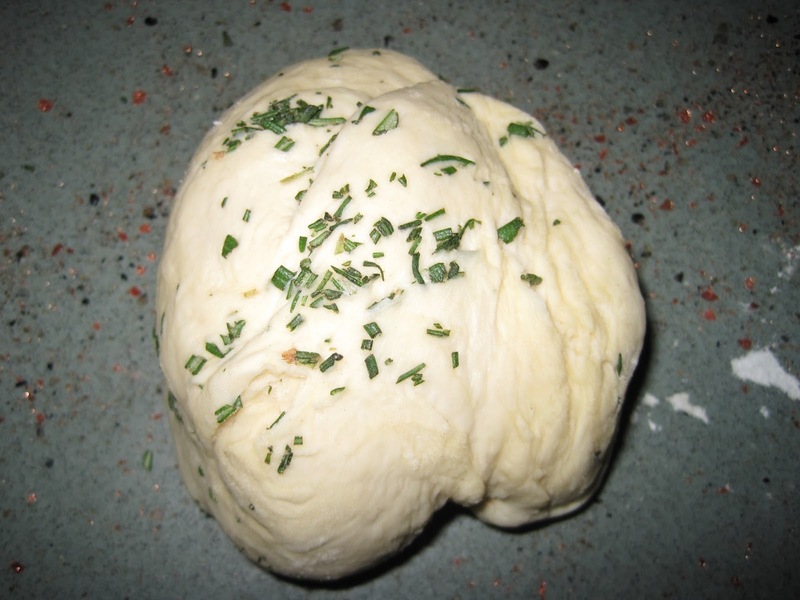 We like to add some chopped rosemary to the pizza dough for extra flavor. Three simple, fresh ingredients! 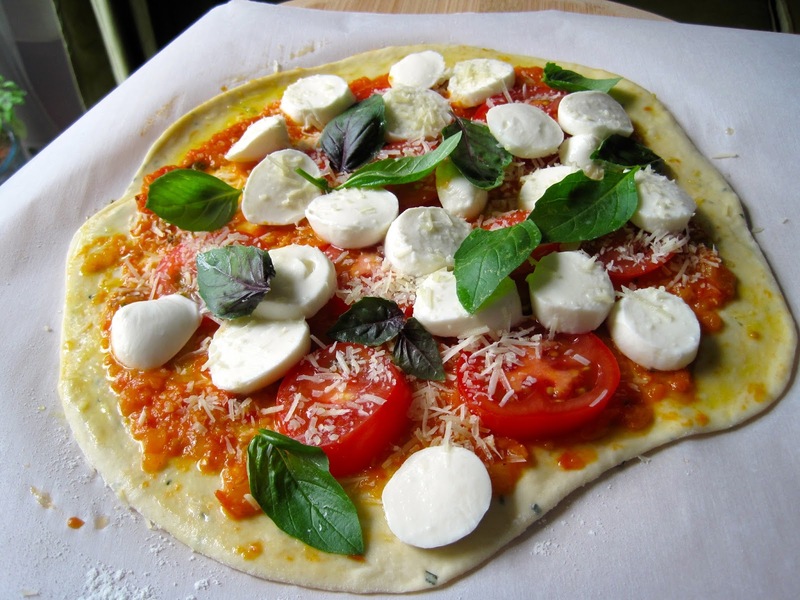 Basil, tomatoes, fresh mozzarella. Bake for approximately 8 to 10 minutes, being careful not to burn it. Blistering is good, burning is not!